The UF Health Davis Cancer Pavilion at the UF Health Medical Plaza house several outpatient cancer services such as radiation oncology, adult hematology and oncology and outpatient infusion (chemotherapy). 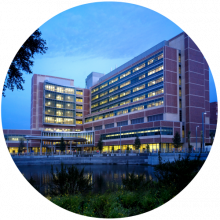 Health professionals caring for patients can easily collaborate with scientists exploring cancer at the cellular, molecular and genetics levels, as they are located across the street at the Cancer and Genetics Research Complex. 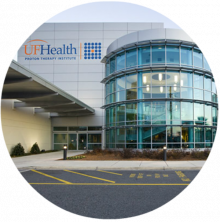 The UF Health Proton Therapy Institute, staffed by UF department of radiation oncology physicians, is the only proton facility located in the state of Florida that has achieved accreditation by the American College of Radiology. Since opening 11 years ago, approximately 6,500 patients have been treated with proton therapy at the institute. 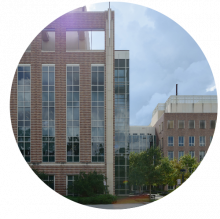 The UF Proton Therapy Institute includes clinics for the pre- and post-therapy and on-treatment evaluation of cancer patients, planning suites, an infusion and anesthesia suite, psychosocial services, a research office and faculty offices. Located across the street from UF Health Shands Hospital, this 500,000-square-foot facility houses 192 private inpatient beds for a variety of patients, including those receiving diagnostic and therapeutic oncology services. The UF Health Shands Cancer Hospital also includes a critical care center for emergency- and trauma-related services. 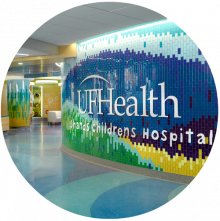 UF Health Shands Children’s Hospital is dedicated to pediatric services, including those related to pediatric cancer, and is located within UF Health Shands Hospital. The hospital’s pediatric hematology and cancer unit is one of the largest of its kind in the Southeast, offering the full spectrum of services and delivering the highest level of care for cancer and blood problems in infants, children and adolescents — including leukemia, lymphoma, brain tumors, solid tumors, nonmalignant hematology and stem cell/marrow transplant. 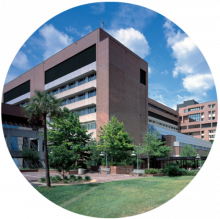 UF Health Shands Hospital is a private, not-for-profit hospital that specializes in tertiary care for critically ill patients. 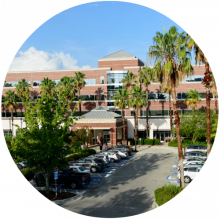 UF Health Shands Hospital is one of the most comprehensive hospitals and one of the leading referral medical centers in the Southeast. It is also home to several specialties with a cancer focus, including urology, radiology, colorectal cancer surgery, breast cancer surgery and bone marrow transplant. Located on the University of Florida campus, the Cancer and Genetics Research Complex is the base of operations for the UF Health Cancer Center in Gainesville. The center has a membership of more than 230 researchers and clinicians who provide cancer care and conduct research for the prevention, early diagnosis and treatment of cancer. 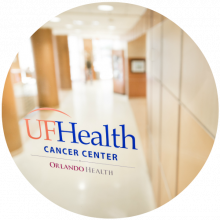 The UF Health Cancer Center delivers multidisciplinary cancer care using the most advanced drugs and treatment technologies, many of which are available only through clinical trials. UF Health Springhill is a four-story, 108,000-square-foot multispecialty medical facility serving northwest Gainesville. Its specialties include dermatology as well as women’s health and diagnostic imaging. In 2013, UF Health and Orlando Health joined programs to form the Orlando Health UF Health Cancer Center, establishing one of the state’s largest, most comprehensive cancer collaborations. This collaboration allows for better-coordinated patient care and expanded research and educational opportunities. 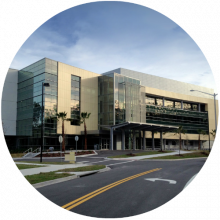 The home of the Orlando Health UF Health Cancer Center is the state-of-the-art Charles Lewis Pavilion, a 220,000-square-foot structure.